Did you know Ted Simmons was the back up catcher and pinch hitter for the Braves from 1986 to 1988??? Don’t you feel better knowing this important bit of trivia??? Where was I??? Right, nowhere. Anywho, the Braves, it could be argued, have the best 1-5 starters in all the majors. And Tim Hudson likely on the big league roster on or around Sept. 1st. Derek Lowe is paid as a number one, but is more of a number 4 (or 5) of late. But his 4.45, while the worst of all the starters, is not horrible. Just horrible for a number one! 😉 It sure seems like his sinker was crisper the first month and a half of the season. I thought fatigue helped sinker pitchers??? 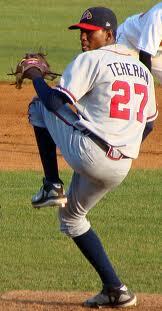 Tommy Hanson is technically our 4th or 5th starter. While he has come down to earth a bit of late, a 8-2 record and a 3.05 ERA in your first year is nothing to sneeze at! He has gone at least 5 innings every time out. A rookie of the year candidate for sure. Hanson is simply not pitching like a 22 year old. Check out Maddux, Glavine, or Smoltz’s stats for their first year or two in the majors and see how truly bad they were! Now for the 2 best starters. Flip a coin. Jair Jurrjens. I still get the feeling he doesn’t get the respect he deserves. A certain baseball writer for the braves didn’t seem to think he was a #1 or 2. He simply gets no run support. 9-8 with a 2.00 ERA. 13-10 last year, with a 3.68 ERA. And he was born in 1986, like Hanson! Hard to think of him as being that young, doesn’t it??? Gee, think the Tigers ever regret handing him over in the Edgar Renteria trade??? Even Lowe said early in the year after he pitched, well we have our best pitcher going tomorrow, talking about Jurrjens. Could have been trying to boost the kids confidence. Could have been just telling it the way it is. But the guy with the best ERA??? Pitched the most innings??? Who has the 2nd most strikeouts in the NL??? Javier Vazquez! As you all my recall, I was NOT happy about getting him this spring. Career ERA over 4. Check out his year by year ERA from 2004. 2004- 4.91. 2005(in the NL by the way) 4.42. 2006-4.84. 2007-3.74. 2008-4.67. We traded Tyler Flowers, a guy that in the spring of 2008 was hitting balls much further than anyone else. We gave him up for some hack, who wilted when called out by his manager to step up his game. Then he pitched in the WC this spring. I figured he was a likely candidate for Tommy John. Instead, 10-8(should be about 14-4) 2.90 era, 162 innings, 178 strike outs! And a month ago, many braves fans, including me, were all for trading him to get the illusive big bopper. Well, right now…we are glad he is still on the club! I don’t know if it’s having a manager that actually respects him, or being closer to family in Puerto Rico (Heard that was an issue in Arizona) but he has been gold, and at the age of 33 is having his career year. Go figure. We all know the bullpen is not perfect. I can’t find any stats for some reason, but I read about a month ago , the bullpen ERA was 13th out of 16 teams in the NL. Kind of surprising. After Gonzo, Soriano, Moylan, and O’Flaherty it’s been a crapshoot most of the year. Everyone knows Manny Acosta has great stuff, it’s being consistent that has been the issue. And you get the feeling the manager doesn’t have a lot faith in him. But, if the arms are to stay attached to Moylan, Gonzo, and Sori, then Logan, Medlen, and Acosta need to be pitched more, and from time to time in big games. But with 5 starters that all have above average stuff, and 4 trusted arms in the Bullpen, and a manager that doesn’t know the meaning of the word quit (both literally and figuratively) the braves should stay in it til the last week of the season! 72: Spring is about to be sprung! Well, after being revived from a near death experience, (and some nasty frostbite) Spring is about to return…unless we are about to enter a new ice age. (20 for a low Tuesday night here in the ATL!!!) I’d rather enter another gilded age, but, I don’t have a say in the matter. Speaking of things I have no say about, your Atlanta Braves! Our Bravos are about to get paid for what many have been doing for weeks if not months already, swinging bats, and throwing the ol’ Horsehide. Or is it cowhide??? Synthetic leather like material, PETA approved??? Whatever, the guys are getting ready for the long grind ahead of them. And that’s just spring training, never mind the actual baseball season…..and fingers crossed, post season. One thing just about every team, save the Padres have in abundance is hope for a good season, and with a few breaks, a real playoff race to be involved in. Remember last spring??? Me neither, but Salty reminded me in a post a few days back that we had something like 10 potential starters last year at the start of spring. We all could imagine a rotation of Hudson, Smoltz, Glavine, Hampton, and perhaps that kid Jurrjens (If he outdueled Chucky and Jo-Jo for 5th slot) giving the Mutts and Phillies phits, err, fits. Hmm, lets, see now, which of that group was still starting in September for us??? A real bopper in Left will make him seem smarter than Einstein! That, and not starting McCann 12 games straight. Anyhoo, I know we will all be writing about our hopes and dreams for the team in the coming weeks, we will get familiar with, and excited about some of the kids we only know based on their names, and what writers have written about them. Baseball tonight occasionally does a segment where guys on the panel have to make bold predictions. Who might be a surprise MVP, what team will win the most games the 2nd half of season, etc. My bold/crazy predictions are that if we don’t get a real left fielder in spring training, Justin Heyward will have a huge spring, sparking talk of him being the left fielder. Also, Tommy Hanson will be so impressive, and Glavine will hurt his hammy in the second to last start of spring and will go north with the club. What are everyone else’s Batpoop crazy predictions for the Braves in 2009??? Okay, continuing on with the theme of “Pitching, Pitching, Pitching,” I thought I would toss in my two cents on the 2009 Braves prospects for the bullpen. Once upon-a-time, the bullpen was a place where you banished hurlers who were either washed up or just not good enough to be a starter. Boy, have times changed. Today, starters go five or six innings or one hundred pitches or their arm falls off, whichever comes first and then the specialists are called upon. A long relief guy, a situational guy for lefties, a ground ball specialist when a double play is needed, a set up guy, the closer and the ever present “why is this guy still on the team because no one ever calls on him” guy. Just like the real “journalists” do, I will work backwards and start with the closer. You know who that is because he is the fellow who gets most of the press and contrary to popular notion, cannot walk on water but he doesn’t need to because it never rains on his parade. Mike “Gonzo” Gonzalez, this kid is going to be a great one because he thinks he is suppose to be. (The antithesis of Manny Acosta) After experiencing Tommy John surgery, he made a nice recovery. Not to say there weren’t some dicey moments but just because you comeback, it does not mean you can pitch to the same level you could before you were hurt. Velocity or lack there of appears to be the most telling sign there is something wrong. The up side of all this is Gonzo will be better in 2009. He will be stronger and his fastball should return to it’s 98 mph range. The best side of all this however is the knowledge he may have gained in finding out he does not have to throw it all that hard to get hitters out. Of course I am still waiting for someone to call a balk on him with all that rocking motion. Actually, I worry more about the Rafael (see, I told you I was hurt) Soriano, I doubt anyone took more heat than Rafael did last year over his on again off again soap opera but mostly about his supposed lack of courage because repeated MRIs failed to show any cause for his loss of speed and recurring pain. After signing a lucrative contract prior to the 2008 season, much was expected of “Mr. Sunshine”. For those of you who believe in the absolute infallibility of the medical profession I have two words, Mark Wohlers. Wohlers was vilified for his seemingly unexplainable loss of control. It was not until the Reds took a flier on him that he decided to allow for an exploratory surgery and discovered he indeed have a serious problem. Soriano had an exploratory performed by Dr. Andrews and a pinched nerved was discovered and corrected. I predict next spring Rafael will again impress the Braves Nation and remind everyone why he was paid closer money. John Smoltz will be at a crossroads next spring. While his spirit is willing, his body may not be. The surgery performed on his shoulder does not have a track record of affording good results. The main reason is the tissues that comprise the labium are not conducive to surgical repair. It would be great to have thunder and lightning available to come out of the bullpen in 2009 but I would not bet the house on it, even though the a fore mentioned house has decidedly less market value to everyone except the tax assessor. If John does return, I predict it will be late in the spring before he believes he is ready. I would expect it will be much later in the season before he could be effective. As Braves fans we can hope but the obese woman may be warming up in the wings for the curtain call of the bearded icon. Will Ohman will most certainly be pitching for someone else next season? Not because he was ineffective last season but because the Braves will not want to pay a set up man more than a couple of million a year. Perhaps the Braves will concede the fact a reliable lefty out of the pen is a valuable piece needed if they are to be serious about beating the Phillies and the Mets in their own division next year. I don’t foresee either of those clubs being weaker next year. Sometimes a GM has to bite the bullet and realize the cost of doing business is greater than you want it to be. I don’t see anyone else on the horizon who could fill Will Ohman’s role as effectively whatever the price. Blaine Boyer is not my favorite Brave. I hope he can change my mind next season. I cannot put my finger on why I have lost faith in the strapping young righty who burst on the scene with such promise with the rest of the baby braves. Perhaps it’s Bobby’s perchance for using a pitcher until his arm falls off and then being surprised at the drop in performance. I had the opportunity observe Blaine on numerous occasions while with the Richmond club and if I could figure him out I would send him a telegram to advise him I was holding his career hostage. Perhaps a change in scenery would help, after all, he has all the tools to be a great reliever. He just has not mastered his Zen. I will conclude my assessment on the Braves potential 2009 relief corps in part four. In this season of political spin, as politicians once again play us for fools and subscribe to the old Lincoln adage that you can fool all of the people some of the time, or at least long enough to get elected, I thought we would turn away from the posturing and one-upmanship for a few moments and talk about something that really means something to us, speculation of how the Braves line-up might look in 2009. Let’s start with that most critical element of any successful major league franchise, pitching. First let’s assume that the Braves will at least try to bring back some of the reliable arms of the past. Tom Glavin may once again be a part of the starting rotation; the surgery to repair his balky elbow may be a resounding success. We likely won’t know until late march if he can be relied upon for one final hurrah in a Braves uniform but I suspect he would like to make one more attempt at glory. John Smoltz may be the biggest question mark. The type of shoulder surgery he endured has not been known to have a high degree of success. Only the grit and determination, which he has shown repeatedly during his long career with the Braves, makes him a possibility to be a part of the Braves staff. While he may or may not be able to perform as a starting pitcher in 2009, I doubt he would be willing to serve in a support role in the Braves bullpen and I further doubt he would sign a contract for less than real market value. We will know by next March if we will see John on the field or in the broadcast booth. Tim Hudson will be a non-factor next year unless the Braves are still in the pennant race in September. It is unlikely he would return to form in less than a year and his spot in the rotation is one of the huge voids that Braves need to filled this winter. We shall see just how good Frank Wren is as a GM if he can duplicate the type of deal his predecessor put together when he brought free agent Greg Maddux to Atlanta. Jair Jurrjens was a real bright spot for the Braves this year. A true gem, for one so young to become the ace of the staff is too great a burden. Hopefully the Braves will spring for a true front line starter so Jair can continue to progress and mature without over using his arm. Too many innings on a young pitcher has repeatedly been shown to be a precursor to a shorten career. Mike Hampton… yes, I know, so many feel he has stolen the money paid to him for the last three years but look at it this way, he was hurt while pitching. He worked like a dog to get back to where he can be considered to be a major league pitcher. Well, after watching him for the past few months, I think he has proven himself pretty well. As he becomes stronger and he regains velocity, he is going to once again be a valuable addition to the staff. I have no idea the type of contract he might be offered by the Braves but I do know one thing for certain, he is going to be on someone’s big league roster next year and the Braves will regret it if they do not re-sign him for 2009. He is still fairly young as pitchers go and if you compare him to Glavin and Smoltz, he is a virtual teenager. Others who have a real chance at making the roster next year…. Jorge Campillo appeared to fade a bit down the stretch this year but for a while he really was a lifeline for the Braves. While he will never be confused as an ace, he was quite serviceable and hopefully he will rest his arm some during the off-season and be ready for action next April. Now while I will admit he is more likely the type of pitcher to be found on the National’s roster than the Braves, he has been much more solid than some of the other experiments Atlanta has tried the past few years. If he can learn to keep his change up down in the zone, he could easily be a 15 game winner for the Braves. There are some other young hurlers in the Braves organization who have a chance to break through next season, Charlie Morton, JoJo Reyes, Anthony Larew, and Chuck James all have an opportunity to step into a role next year. I will give my prospectus of them as well as other young Braves hurlers in the organization plus the bullpen in my next contribution.